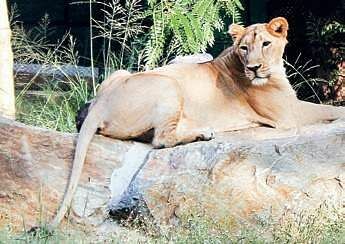 MYSURU: IN what may hit the breeding of endangered species of Asiatic lions for sometime, an asiatic lioness died at Sri Chamarajendra Zoological Gardens, popularly known as Mysuru Zoo, on Wednesday. Ranitha, the big cat aged seven and half years, was found injured on right and left shoulders, after a fight with her companion Shourya on October 26. Following this, it had stopped taking food. Veterinarians collected blood samples and found that the animal was also suffering from generalised infection. Even after the treatment was launched, the animal did not show any improvement, besides going off the feed. Blood samples were collected again along with samples of swab, lacrimal and nasal that were sent to Centre for Cellular and Molecular Biology, Hyderabad. The report is awaited. Zoo executive director C Ravishankar said the incident occurred a day after they were released for mating in the off-exhibited area. The animal was brought from Sakkarbaugh Zoo in Junagadh, Gujarat, a year ago in October, under an animal exchange programme. While the female was brought from Sakkarbaugh, there were also plans to bring a male from Rajkot Zoo 10 months ago. It was intended at breeding endangered species at the menagerie. A pair of lion had been brought from Sakkarbaugh five years ago. Gowri, the lioness, delivered a cub after sometime which did not survive. Following the death of Ranitha, the zoo has been left with four lions- Shourya and Gauri both pure bred Asiatic species and Rakshita and Darshan, the cross bred animals.